International Journal of Research in Health Sciences,2016,4,2,39-42. 1Assistant Professor, 2Associate Professor, 3Senior Registrar, Upgraded Department of Pathology, Osmania General Hospital. Afzalgunj, Hyderabad, Telangana State, INDIA. A 65 year old female presented to Osmania General Hospital with a history of swelling in the right breast since 3 months. On palpation, the swelling was occupying the upper inner and outer quadrants. Clinically,a diagnosis of phyllodes tumor was made. Ultrasonography of breast swelling revealed a breast abscess. Fine needle aspiration cytology was attempted and a diagnosis of cystic lesion of breast was made. Simple mastectomy was carried out. Histopathological examination revealed a cystic tumor comprising of a cribriform pattern. 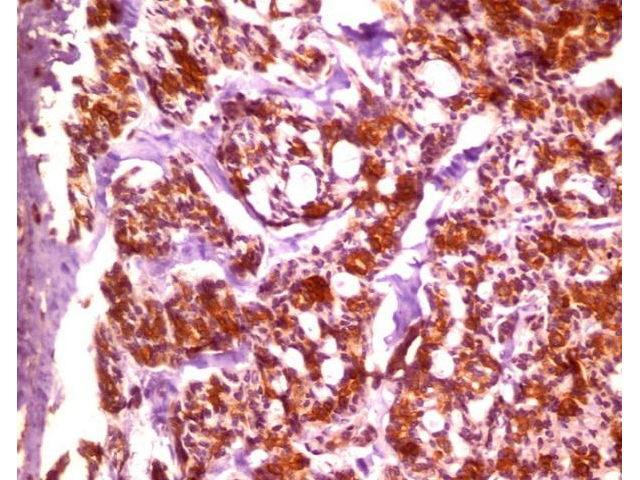 Special stains and immunohistochemistry was helpful in final diagnosis of tumor as adenoid cystic carcinoma of breast.